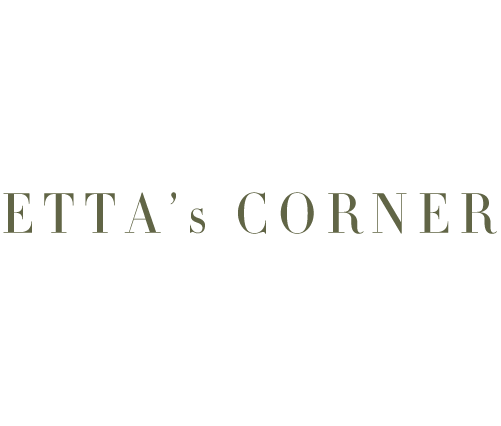 Orzotto... you say? What on earth is Orzotto?! It's yummy is what I say! 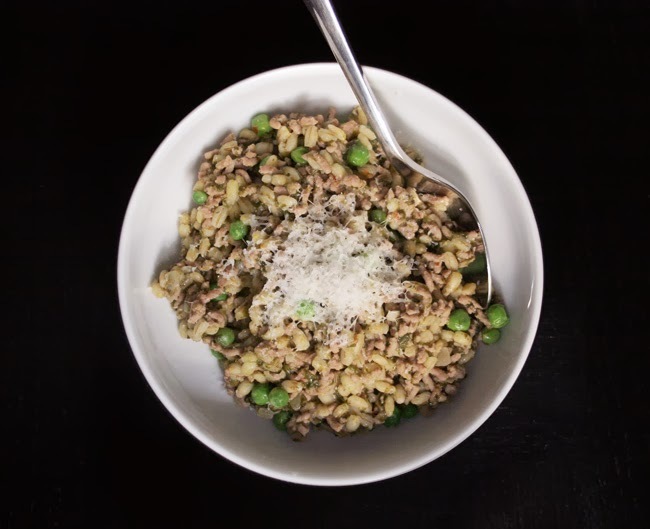 More texture than your usual Risotto, more flavour and healthier. It's a win, win situation. We cooked this quite a few weekends ago, after we spent all day cleaning our flat, tried our new Pilates DVD, popped open a bottle of delicious Tempranillo and then started cooking. 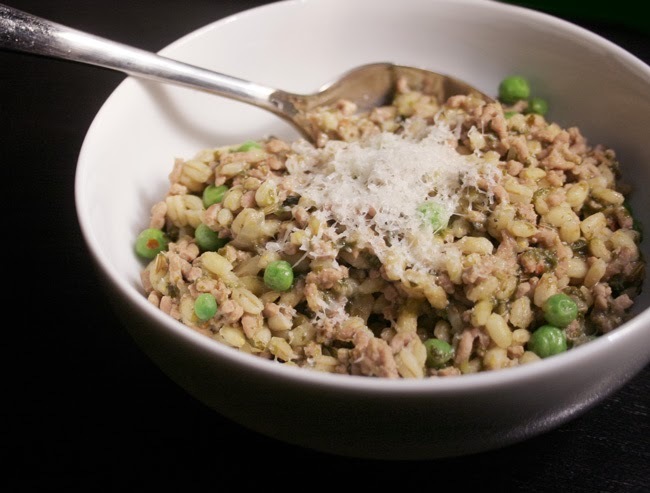 This Orzotto is the sort of healthy, filling and comforting meal you need on a cold and rainy Sunday evening. It's the kind of dinner you eat, snuggled up on the sofa, possibly in front of a fire place, sipping on a rich red wine and watching your favourite series. Hope you enjoy it as much as we did. 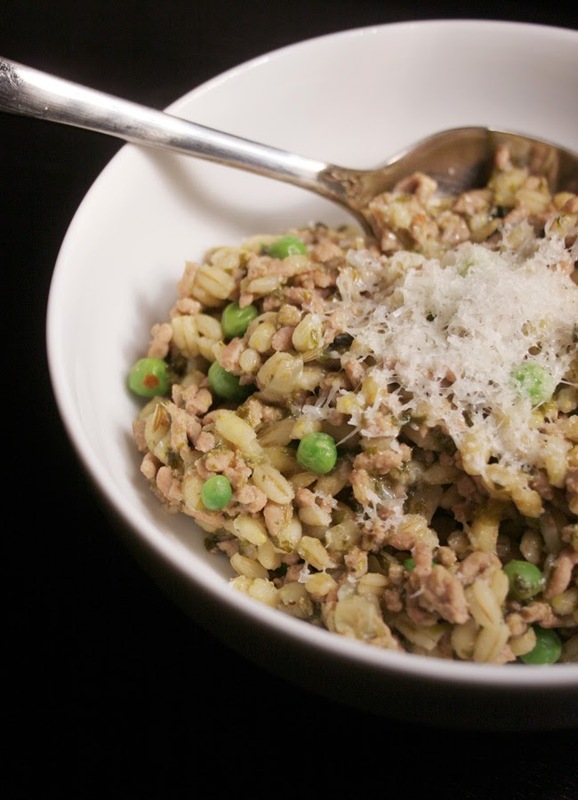 Just as Risotto this is a very flexible and forgiving recipe! We made a Middle Eastern inspired version as well which was absolutely delicious and I definitely will share with you soon. Heat the olive oil in a heavy bottomed pot, add the onions, garlic, fennel seeds and chilli flakes and sautée on a medium heat for a few minutes until the onions start to soften. Turn the heat up a little, add the mince bit by bit and fry until browned. Mix in the spinach and warm up until defrosted then stir in the pearl barley. Turn the heat up to high, wait a minute or so and then deglaze the pot with the white wine. Leave to bubble away until the wine is almost completely evaporated. Pour in the stock, give it all a good stir and leave to cook over a medium-high heat for 30 minutes. Stir occasionally to avoid the barley sticking to the bottom of the pot. After 30 minutes the barley should be tender, the stock almost completely evaporated and you should have a silky orzotto. Mix in the frozen peas and cook until defrosted and warmed through. Finally stir in the lemon juice, taste for seasoning and serve with a little grated Parmesan.